It’s just a head pin – so why do we have thirty different kinds? We got in several new orders recently, and each one had different and new kinds of head pins. As we started to try and make room on our findings table for all the new stuff, I got to wondering just how many kinds of head pins we carry. Thirty. That’s right, thirty. “It’s just a head pin. Why do we need so many?”, I thought. I also thought about what a new beader might be wondering when trying to choose between thirty different kinds. Thirty. I keep saying that because even I was kind of stunned when I actually counted them. 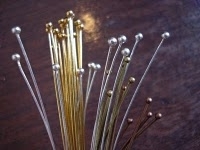 Head pins are simply a piece of wire with something at the end (the head) to keep a bead from falling off. You put the beads on, make a loop and “voila!” you’ve got a dangly charm to hang from an earring, necklace or bracelet. Make your metal and finish choice based on your design and budget. They can be made of sterling, gold filled, natural brass, antique gold finish, antique copper finish, copper, base metal, gold plated base metal, silver plated base metal. Whew – that’s a lot of finishes! Whatever happened to just silver and gold? Make your length choice based on what’s needed for your design. They can be anywhere from 1” to 3”, but are typically 2”. Make your gauge choice based on your bead choice. 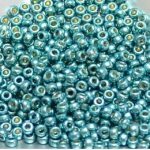 26 gauge is a necessity for small pearls and gemstones, but 24 gauge will fit most other beads. You may want a loop end (eye pin) if you’re hanging another dangle from the end of this one. Otherwise, the head will usually be either flat or a ball. The ball makes a pretty finish for a large pendant, and you’ll need to check the head size to make sure it’s big enough to keep your bead on. If not, you can add a small metal bead or seed bead. My newest earring design makes use of our new antique copper ball end head pins with gray mother of pearl and faceted quartz beads on an antique copper chandelier finding. This earring is a light and airy design with a modern metal twist. Come on over and make a pair for yourself!